Another book featuring the art of Jindrich (Henry) Degen is available for purchase. 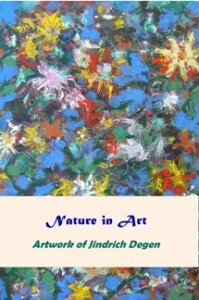 Entitled Nature in Art – Artwork of Jindrich Degen, the book features artistic expression that is related to nature. The 128 art works are arranged under ten categories. The collection contains both realistic and abstract art. Themes include land and sea; trees, leaves and flowers; as well as living creatures. The last section, entitled “Fantasy”, largely comprises original works from Jindrich’s imagination. The colourful realistic and symbolic works in Nature Art will leave an indelible impression on the hearts and minds of visitors to this “gallery in print”. Born in 1923 in Prague, Czechoslovakia, Jindrich (Henry) Degen has enjoyed artwork since his childhood and adolescent years. However, after completing secondary education, he chose to pursue his other great interest, music, following in the footsteps of his father, Jindrich Degen (1885-1972), who was the cor anglais player in the Czech Philharmonic Orchestra. From 1943 until 1979, Jindrich (Henry) Degen performed as principal oboist in various symphony and opera orchestras in Prague (now Czech Republic), Gothenburg (Sweden), and Melbourne (Victoria, Australia). He also published educational music for the oboe in Prague, England and Germany. After his retirement in 1979, Jindrich moved from Victoria to Queensland where he could begin to fully devote himself to art. There he took a four-year art course at the Sunshine Coast Institute of TAFE (Technical and Further Education). Later in the Redlands, as a member of the Yurara Art Society, he attended workshops conducted by prominent artists, including Irene Amos, Jan Jefferies, Jack Oudyn, and Michael John Taylor. Colour and Contrast – Artwork of Jindrich Degen (published in 2013). Now a respected local artist, Jindrich continues to take part in various art activities and exhibitions, especially those of the Yurara Art Society. During March-April 2004, he had a solo exhibition in the Redland Art Gallery. In July-August 2010, he displayed a selection of his mandala paintings at the same gallery. In November 2013, he had a solo exhibition at the Yurara Art Society Gallery in Thornlands. Another exhibition is planned for July 18 – September 5, 2015 at Redland Art Gallery, Capalaba. Available at Amazon and other online outlets. Australian readers may find a better value for this book at Fishpond, which sells discounted books and sends them postage-free.